Big views on the BBT. 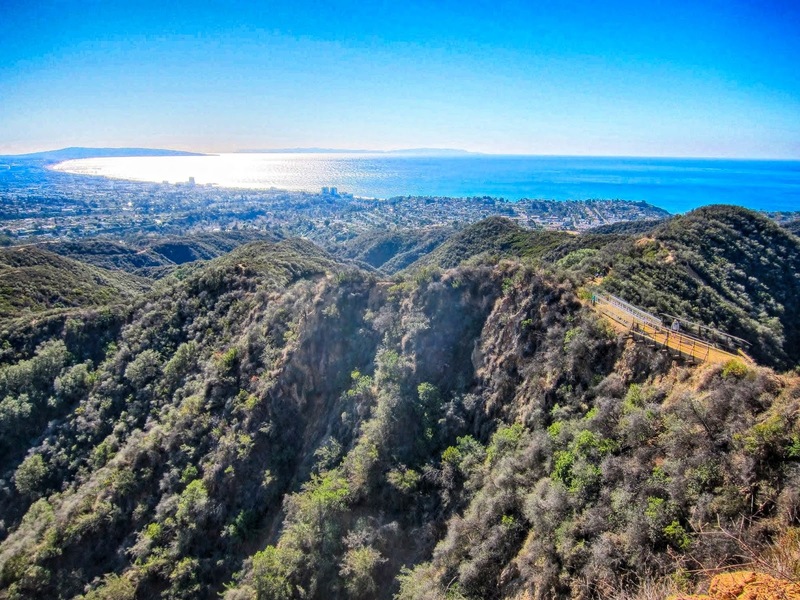 The Santa Monica Backbone Trail follows the crest of the Santa Monica Mountains for 68 miles from Point Mugu to Will Rogers State Park. The BBT (Backbone Trail) climbs 19,000 feet (and descends 18,500 feet) over a collection of dirt trails, gravel roads and even some rock scrambling. During the spring of 2017 my hiking compadre Hobbes and I set out to thru-hike the entire route in under 3 days. The heat on the steep climbs was grueling, sometimes well into the 90's, with no natural water sources, exposed trails and little shade. . . but the miles of wildflowers and epic views made every step worth while. The popular "North Lake to South Lake Loop" or "Evolution Loop" is usually referred to as a "loop". . . The Forest Service and Recreation.gov describe it as the "North Lake to South Lake Loop". 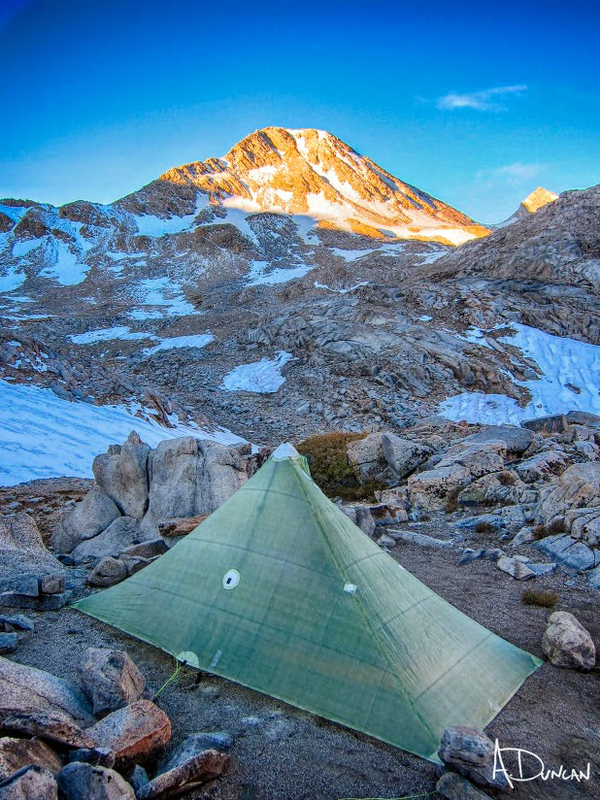 There are countless online trip reports for the "loop" including some on Summitpost, Backpackinglight and High Sierra Topix. I stopped counting after finding 14 videos for the "loop" on YouTube. According to the FKT site the current fastest known time for the "Evolution Loop" is 10 hours and 31 minutes. Impressive, although not so much considering the FKT holder had to hitch a ride back to North Lake after "finishing" at South Lake. I have often wondered what it would be like to do a proper loop and include the last section over the Tyee Plateau and close the circle back to North Lake . . . So last week I hiked from North Lake to North Lake and along the way threw in some cross country travel and peak bagging to keep it interesting. In the end it was a 64+ mile loop with four passes and 34,200' of elevation change. I started with my usual late night drive through the desert on Wednesday night to camp at the base of the East Side of the Sierra near Independence. Spending a night at 4,000' always helps me acclimatize to the big climb over the Sierra Crest on the first day, and by Thursday morning I was ready for the climb over Lamarck Col from the North Lake trailhead. North Lake to North Lake Loop, 64 miles. The summit of Mt. Whitney 14,500'. In the spirit of Alastair Humphrey's Microadventure I took off for a quick late season adventure into the High Sierra last weekend. In an effort to fit as much adventure into a 'micro' amount of time I decided to climb the two nearest 14'ers in the Southern Sierra and hike the distance between each one via a 30 mile cross country route along the way. To make this a mini-thru hike I left a car at Horseshoe Meadows at the southern end of the route and took a shuttle to Whitney Portal in the north where I would begin. Although the route was only 30 miles the total elevation change was over 23,000 feet via mostly cross country terrain with a few class III climbs to keep things interesting. Once the shuttle dropped me off at Whitney Portal the only way back to the car was to commit to the route. . . and I began to wonder if my plan was too adventurous for just one weekend. Mt. Whitney & Mt. Langley Microadventure route. This year the mountain gods provided a tremendous opportunity. . . a three week window during the prime summer season to explore the High Sierra. Through a series of unplanned circumstances my usual one week trip morphed into a three week epic adventure! After pouring over maps and considering many possible routes I finally settled on a cross country traverse of the High Sierra. . . 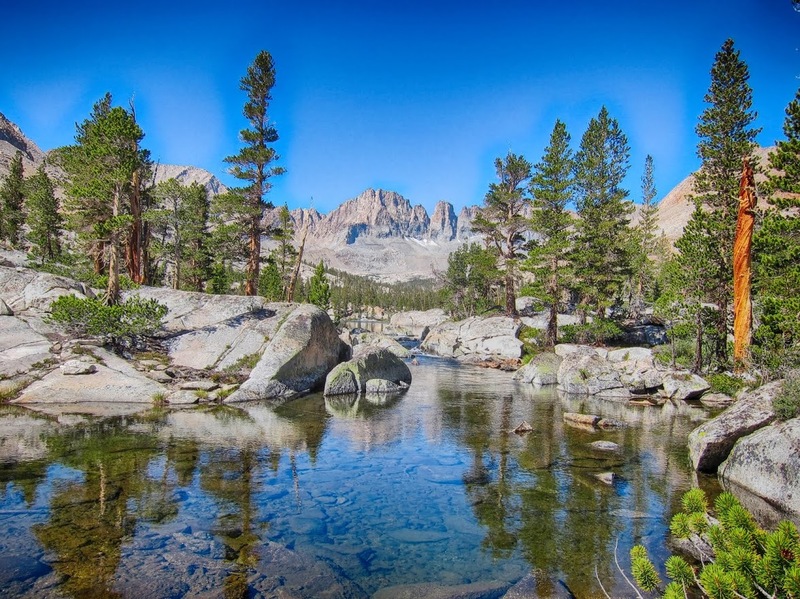 I stitched together portions of the Sierra High Route, South Sierra High Route, Kings Canyon High Basin Route along with some of my favorite cross country alternatives to create a cross country traverse of the High Sierra. In the end I climbed 25 High Sierra Passes over 257 miles in 22 days. I started preparing for the trip in January and followed Alan Dixon's training program which included long weekend hikes up to 30 miles per day leading up to the start in July. Some of the climbs and long days were more challenging than I anticipated and the fields of wild flowers at the beginning almost derailed the whole trip. Although I planned on climbing 31 passes over 295 miles I had to skip the sections from the Lyell Fork to Mammoth and Ionian Basin due to allergies. Fortunately I was able to re-energize during a zero day and get back into the wilderness to finish the route. Many thanks to the endless support from my wife Candy. I missed you! Cross Country Sierra Traverse: 25 Passes over 257 miles. In the spirit of Amy Lauterbach's Big Seki Loop and Mike White's Circle of Solitude I decided to create my own loop through the Sequoia & Kings Canyon area. . . but I wanted to stay off existing trails and use cross country routes as much as possible. At times bad weather chased me down to lower elevation but in the end I crossed 7 High Sierra passes over 81 miles. After planning all winter I was excited to get into the backcountry. . . but the forecast was for thunderstorms during the first four days! I figured it couldn't be all that bad so I headed into the unknown. I had rain gear, a double wall ultralight tent and even a new custom backpack. I was ready for the worst possible conditions, and at least I could get closer to the high passes than I would if I just stayed home. It seemed like a logical decision at the time. . . The outlet of Colby Lake. Starting early in the cirque below Colby Lake I kept a fast pace almost all the way to Colby Pass. The wildflowers along the outlet creek from Colby Lake were beautiful. I took a break at an amazing camp site right above the shore of the lake (mental note: great camp for next time). The altitude, heat and humidity finally slowed me down at the base of the long boulderfield but I made it to the top by mid morning. The trailwork on the way to the top is impressive, much like the switchbacks on Mt. Whitney. This was a beautiful clear day and I spent hours exploring Kaweah Basin and the neighboring Picket Creek Basin. So much classic Sierra scenery in one day! 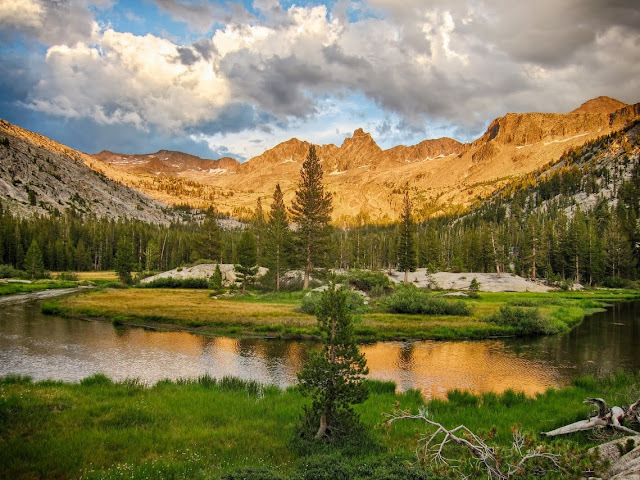 Awesome view of the Kaweah Peaks from Island Lake in Kaweah Basin. Lisa, Michael and I got an early start and headed to Pyra Queen Col, one of the few passes that provide access into or out of Kaweah Basin. Pyra Queen Col is a Class II cross country pass and involves steep and loose boulder and scree fields which make for slow going at times. . . but the views are worth the effort. Days 8 and 9 were spent exploring some of the High Sierra Trail with a side trip to Tamarack Lake. After many years in the High Sierra I was looking forward to finally seeing Precipice Lake and Hamilton Lake, two of the beautiful lakes along the High Sierra Trail. The scenery didn't disappoint and after some bushwhacking I made camp in the dark along the shore of Tamarack Lake. This spring my hiking compadre Karl extended an invitation to join him on his annual early season hike on the PCT. I am used to snow in the High Sierra, and I usually bring snowshoes and serious winter gear. . . but Karl assured me that in the early spring we could go without the usual winter setup and hike on the snow with trail runners. I watched the forecast and snow level indicators online, and it looked like we lucked out and would be enjoying a rare week-long window of sunny skies and plenty of hard packed snow! I live at sea level but spend most days planning another adventure in the High Sierra. Here you will find trip reports and photos from my backpacking treks and info on creative lightweight gear.